Removes relatively new or weathered acrylic coatings. 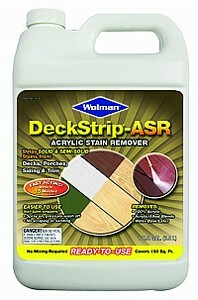 Removes solid or semi-solid deck and siding stains. Easier to use than paint strippers - spray on, rinse off, no scraping or sanding. Strips multiple layers in one application. Fast-acting - remover dissolves most coatings in 15 minutes. Clings to vertical surfaces to ensure effective stripping of posts, spindles, fencing and siding. Will not etch glass or leave hard-to-remove residue. Easy soap and water clean-up. 100% biodegradable - so remover won't harm grass, plants or shrubs. © PaintSundryCatalog.com 2017. All rights reserved.